B&G Foods announced today it is voluntarily recalling 1,280 cases of a single date code of 40 oz. 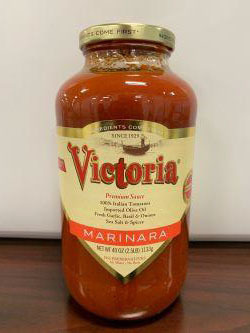 Victoria Marinara Sauce, with a “best by” date of 03/06/2022, after learning that the product may contain cashew allergens that are not declared on the product’s ingredient statement. People who have an allergy or severe sensitivity to cashew run the risk of serious or life-threatening allergic reaction if they consume this product. There is no health risk associated with this product for individuals without an allergy to tree nuts. This recall does not apply to any other “best by” dates, sizes or varieties of Victoria sauces sold in the United States, all of which are correctly labeled. This recall only affects a very limited number of cases of product produced at one facility on one production day. B&G Foods discovered this issue when it received one consumer complaint alleging a cashew allergic reaction. B&G Foods initiated the recall of this product based on the results of its investigation and testing that indicated the possible presence of cashew allergens in up to 1,280 cases of this product with this particular “best by” date. This recall was initiated in cooperation with the FDA after it was discovered that the affected product with this particular “best by” date may contain cashew allergens. B&G Foods this Saturday, February 23rd and Sunday, February 24th by calling 800.811.9104 from 10:00 a.m. to 6:00 p.m. Eastern time.